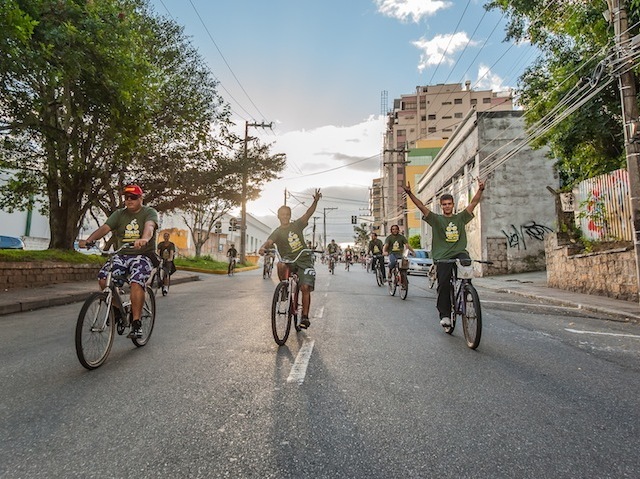 Cities like Florianópolis, Brazil (pictured) are helping make investments more responsive to residents’ needs through public engagement in urban mobility planning. Picture by Chan360/Flickr. Eighty-five percent of Brazilians live, work, and play in cities. As such, urban mobility is a fundamental driver of quality of life for the vast majority of the country, enabling access to jobs, healthcare, schools, and other everyday needs. In 2012, Brazil’s national government recognized this importance by enacting the National Policy on Urban Mobility, which requires cities with 20,000 residents or more to develop urban mobility plans in order to receive federal funding. At the same time, the federal Growth Acceleration Program (Programa de Açeleração de Crescimento [PAC]) has made US$ 57 billion available for 88 mid-size cities to develop and implement sustainable urban mobility plans. Earlier this month in São Paulo, EMBARQ Brasil and WRI Brasil hosted the Sustainable Urban Mobility: Practices and Trends seminar, which featured representatives from 40 medium and large Brazilian cities as well as sustainable urban mobility experts from around the world. Participants gathered to share their experiences in developing people-oriented transport systems, urban development strategies that cut pollution while increasing quality of life, and how to effectively institutionalize public participation in mobility planning. As representatives from São Paulo, Belo Horizonte, Florianópolis, and more cities highlighted, city leaders are increasingly aware that mobility solutions must involve sustained public input to ensure fairness, public awareness, and decisions that have public backing and are informed by the diverse needs of the public. Under Brazil’s mobility law, cities are even required to ensure public participation in the development and implementation of their mobility plans. The importance of broad-based citizen participation was brought into the spotlight in 2013 when protests – partially triggered by rising public transport costs – spread from Porto Alegre to nearly a dozen cities. While protesters voiced numerous complaints, common themes included corruption, lack of transparency around public investments, and municipal decision-making that was not responsive to local needs. The seminar revealed common themes relating to public participation in mobility planning. For one, many Brazilian cities understand the importance of engaging their citizens in decisions on transport and urban development, but guidance on good practice for public participation for sustainable cities is still lacking, particularly for the Brazilian context. Furthermore, cities vary greatly in terms of experience and capacity in building public participation. Informed participation: city leaders should disseminate information to the public at least 30 days ahead of time to explain the decision-making process, their opportunities to engage, and how potential decisions may impact their lives. Lower barriers to accessibility: city leaders should hold workshops and public forums at multiple times and locations to better enable the public to participate. Special consideration may be given to marginalized or poorer communities, or those who may be disproportionately affected by decisions. Combine traditional with technology: web-based platforms and mobile applications, when appropriately designed, can help reach new audiences and make participation less costly. However, these should not be used in place of more traditional, in-person forums. If possible, use random surveys and focus groups to increase representation. Build in accountability and transparency: public comments should be recorded and feedback from decision-makers should be disseminated so that participants know that their ideas were considered, whether they were accepted or rejected, and for what reasons. PLAMUS – Plano de Mobilidade Urbana Sustentável da Grande Florianópolis: 13 municipalities in the Florianópolis metropolitan region are developing a metropolitan mobility plan that has gathered public inputs using workshops held in different cities of the metropolitan region, public surveys, and online engagement. Large-scale public engagement for São Paulo’s master plan: the city of São Paulo crowdsourced input using “Volunteered Geographic Information,” held 114 public hearings, and engaged over 25,000 people, gathering over 10,000 contributions according to city officials. European Sustainable Urban Mobility Plan (SUMP): a partnership of governments, civil society, and the private sector are producing guidelines for public participation in sustainable urban mobility planning based off experiences from over 30 European cities and other global expertise. EMBARQ Brasil’s publication Step by Step Guide to Developing an Urban Mobility Plan (O Passo a Passo para a Construção de um Plano de Mobilidade Urbana) is another tool built to help cities adopt best practices for engaging their citizens in mobility planning. At the national level, the Brazilian Ministry of Cities just launched a crowdsourcing website to gather input on public priorities for urban development, which will inform Brazil’s official participation in the U.N. Habitat III summit in 2016. These tools and resources will help Brazilian cities strengthen urban mobility planning through public participation and use federal funding to create the greatest impact on quality of life.